Deputron is a minifigure released in 2014 as part of the LEGO Movie theme. Deputron has brown legs, light blue hips, a brown torso, tan arms, grey hands, and a grey head. The legs are printed to depict pants and cowboy boots with a low hanging leather holster, and the hip piece is printed to depict a belt. The torso is printed to depict a tan shirt with a brown vest and a light blue bandanna, with a gold star on the left side of his vest. His head is also printed to depict a robot face. While his head is a more metallic grey, his face is a lighter grey, and features one long, thin, red eye and a serious mouth. He wears a brown cowboy hat and carries a grey gun. 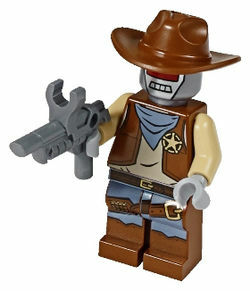 In The LEGO Movie, Deputron was among the robots controlled by Lord Business that attacked Emmet, Wyldstyle, and Vitruvius in the Old West.